This is the compilation of the Nave's Topical Bible Concordance and King James Bible with focus on Nave's Topical Bible Concordance. It contains 5,320 definitions and has 323,580 cross-references. 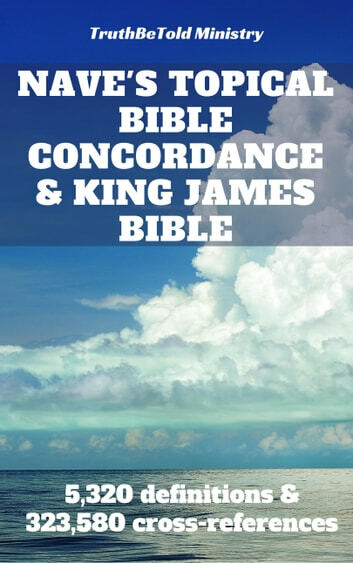 The reason for the high number of cross-references is that each word within a given definition is further linked to its own definition in this ebook, Nave's Topical Bible Concordance and King James Bible, if such a definition exists. We have also included the King James Bible and linked the Bible references from the dictionary to the Bible and vice versa, through and through. Please note that the text for this publication comes from Public Domain and can be found in many different formats on the internet. What makes this publication stand out is the way we have added the cross-references, making it a great tool for you to enjoy. Nave's Topical Bible is a book written by Orville James Nave (1841–1917) and published by Thomas Nelson Publishers. Nave was a chaplain in the United States Army and referred to his work as "the result of fourteen years of delight and untiring study of the Word of God." 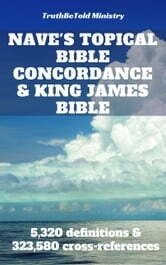 It is a topical concordance of the Bible, and contains Biblical references to over 20,000 topics. Scripture is quoted over 100,000 times; the same Scripture citation may appear under several headings. The topic headings are broad, covering many religious concepts, geographical regions, and names of Biblical figures. While theological concepts such as salvation and worship are included, a wide range of topics, such as Biblical references to ropes, are also included. This reflects the author's intention, as stated in the book's preface, to "...note and classify everything found in the Scriptures".